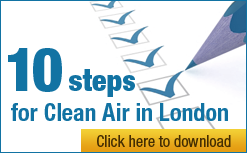 Clean Air in London (CAL) is pleased to respond to the EAC’s Call for evidence on air quality. There has been a serious lack of progress by the Government and the Mayor of London in tackling air pollution since the EAC’s two excellent reports on air quality. There are many signs of failure to act on air pollution across Government. For example, HM Treasury seems intransigent on fiscal and financial measures and the Department of Transport (DfT) still myopically prioritises greenhouse gases over air pollution measures e.g. a DfT Minister stated last year that he would take no action to improve air pollution that [increased] carbon dioxide (CO2). The Department of Environment Food and Rural Affairs (Defra) must be singled out for the worst failures – CAL has shown Defra misled the European Commission and has systematically hidden information about air pollution (while insisting on controlling (in)action by other Departments) i.e. the worst combination of authority without responsibility or accountability. CAL is getting the impression that Defra may be shifting from passively covering up the air pollution issue to actively covering up the issue and its role in fighting it. Only the Department of Health (DoH) has begun to take necessary and long overdue action e.g. by publishing estimates of the number of deaths attributable to air pollution, including air pollution in the Public Health Outcomes Framework and issuing the first proper smog warnings in April 2014. In London, the Mayor has made little progress in reducing air pollution concentrations while continuing to make claims that vary from the sublime to the ridiculous. It is possible, after adjusting for the effect of a number of very wet years, that a busy fool might have achieved greater reductions in air pollution concentrations and/or done more to warn the public about air pollution than the current Mayor. In reality, London has a serious particle (PM2.5 and PM10) air pollution problem and may have the highest officially monitored levels of nitrogen dioxide (NO2) in the world at over three times World Health Organisation (WHO) guidelines and legal limits in places, mostly caused by diesel vehicles. Despite this public health catastrophe, the Mayor continues a ‘love affair’ with diesel vehicles that defies belief and logic. The full extent of these failures by the Government and the Mayor and their consequences has become much clearer since the EAC’s last report. For example, the health evidence of the dangers of short but particularly long-term exposure to modern, largely ‘invisible’, air pollution has increased sharply in certainty, seriousness and amount. For example, London may have the highest officially monitored levels of NO2 in the world. See Diesel “Deadlier than petrol” in The Sunday Times on 6 April 2014. Recent scientific studies suggest the health effects of NO2 on mortality may be as great as those of PM2.5 and independent to them. See the Appendix for details. Recent developments include the ClientEarth’s legal case against the Government, the European Commission’s Clean Air Policy Package and it singling out the UK for infraction action and major reports and statements by the WHO. In summary, as the UK approaches the sixtieth anniversary of the first ‘Clean Air Act’ for the City of London Corporation on 5 July 1954 that fought short term exposure to ‘visible’ air pollution we must warn the public about the dangers of ‘invisible’ air pollution and grasp the opportunity to reengineer our cities to fight air pollution which the WHO calls the world’s largest single environmental health risk. CAL is a not-for-profit company limited by guarantee with a mission to achieve full compliance with World Health Organisation (WHO) guidelines for air quality throughout London and elsewhere. It is non-party and has a large number of supporters both organisations and individuals. CAL’s sponsors and clients include Camfil (a world leader in air filters for buildings), the Licensed Taxi Drivers Association (LTDA) and the New West End Company (which represents some 600 retailers and property owners in the West End of London). There has been a serious lack of progress by the Government in tackling air pollution since the EAC’s two excellent reports on air quality. CAL has responded to several Defra consultations relating to air pollution and published the results of several of its investigations since 2011. See the Appendix for details. The DfT made hollow promises on 4 December 2013 to outlaw the removal of factory-fitted diesel particulate filters (DPF). See the Appendix for details. It seems to CAL that Defra is withholding or delaying an important report on the latest testing of real world emissions by David Carslaw and others. This testing data is likely to shed light on the success or otherwise of Euro 6/VI technology to reduce diesel exhaust emissions, the use of retrofit technology and real world emissions from the Mayor of London’s New Bus for London. Please insist on it being released forthwith. Alarm bells are ringing about the lack of action to reduce PM2.5 air pollution. The need for urgent and substantial action was highlighted in a report by the Air Quality Expert Group in December 2010 titled ‘PM2.5 in the UK’. See the Appendix for details. The Government is hiding breaches of EU legal limits by saying only it can determine such breaches e.g. only it can judge the contribution of natural sources and achieve the data standards? CAL discovered through a Freedom of Information request that levels of carcinogenic PAHs exceed national objectives at six places in the UK in 2012, all of which are in London. The Government’s report on 2012 admitted that annual average concentrations of NO2 have not declined during the last 10 years at eight long-running traffic urban sites that include Bath Roadside, Camden Roadside, Glasgow Kerbside, Exeter Roadside, Haringey Roadside, London Marylebone Road, Oxford Centre Roadside, and Tower Hamlets Roadside) (Figure 5-6 on page 43 of the full report). CAL is getting the impression that Defra may be shifting from passively covering up the air pollution issue to actively covering up the issue and its role in fighting it e.g. letting DoH and the Met Office lead the public facing work during the recent smog episode. There has been a serious lack of progress by the Mayor of London in tackling air pollution since the EAC’s two excellent reports on air quality. The Mayor has made claims about his successes that range from the sublime to the ridiculous. Worse, it is possible, after adjusting for a number of very wet years, that a busy fool might have achieved greater reductions in air pollution concentrations and/or done more to warn people than the current Mayor. Many of these claims are analysed below. Reductions? “Just in the last six years (to pick a period entirely at random) we have seen a 20 per cent reduction in London’s emissions of nitrous oxide – one of the nastiest and most damaging forms of air pollution – and a 15 per cent reduction in the most baleful forms of dust, the so-called PM10s and PM2.5s”. Source: The Daily Telegraph, 6 April 2014. CAL emphasis. CAL comment: These claims seem to be based on computer modelling of emissions in the London Atmospheric Emissions Inventory (LAEI) 2010 which assumed reductions in projection vehicle emissions. Presumably the Mayor meant to say ‘oxides of nitrogen’ not nitrous oxide since the latter is laughing gas. CAL understands the Mayor’s computer modelling excludes important sources of emissions (e.g. illegal recreational wood burning and river transport) which may explain the disparity with the reality of air pollution concentrations for which health guidelines and legal limits are set. CAL guesses that the LAEI 2010 underestimates NOx and NO2 emissions by 10-30%. The LAEI needs urgently to be updated for the latest work by David Carslaw on real world emissions and to include all air pollution sources. Doing more? “…we have done more to address this problem than any other city.” Mayor’s Office, Evening Standard, 21 February 2014.
measures to reduce emissions from Non-Road Mobile Machinery. air pollution warnings in Brussels and Paris. The most recent published independent NGO assessment of London compared to other European cities gave it the lowest ‘F’ rating and ranked it 12th behind cities such as Berlin and Paris. Outside Europe, New York has cleaned up its taxi fleet and reduced cooking emissions from restaurants and China is taking huge steps to tackle air pollution such as scrapping six million cars and restricting outdoor cooking and fireworks. CAL comment: Of course this is a meaningless claim since it is the ONLY bus of its kind. Worse, its weight, commitment to diesel hybrid technology and lower passenger capacity will be millstones around London’s neck for 14 years as there is no second-hand market for non-standard London buses at the end of their traditional initial seven year contract term. CAL comment: Phases 3 and 4 of the low emission zone were scheduled by Mayor Livingstone. Mayor Johnson’s Air Quality Strategy published in December 2010 included a Phase 5 from 2015. Mayor Johnson postponed Phase 3 of the low emission zone by 15 months from October 2010 to January 2012 and says he will scrap the planned Phase 5. Congestion charge? Boris has tightened the congestion charging zone discount. CAL comment: Mayor Johnson introduced a 100% discount from the congestion charge for Euro 5 diesel vehicles emitting less than 99g/km of CO2. His manifesto for May 2012 even claimed this was a ‘green’ measure. The Mayor belatedly announced that eligibility for these discounts will be tightened after seeing a huge increase in the number of diesel vehicles driving into the CCZ. CAL comment: TfL estimated in 2006 there would be 515,000 people exposed to illegal levels of NO2 in 2012 after implementing Phases 3 and 4 of the LEZ. The Mayor now estimates, based on the LAEI 2010, that 1.7m Londoners were exposed to illegal levels of NO2 in 2012 and says the figure was much higher in 2008. CAL has no confidence in these recent claims as they are not consistent with trends in actual air pollution concentrations as measured by the highly regarded London Air Quality Network. Cycling? Spending £1bn on cycling. CAL comment: CAL understands Camden spent about £67,000 on 500 metres of segregated cycle lanes. Please ask the Mayor how much of his claimed spending could be categorised as public realm rather than cycling improvements, the timing of his spending and the cost per kilometre of his cycling lanes. Charging points? The Mayor has introduced 1,400 electric vehicle charging points. CAL comment: Please ask the Mayor how many of these charging points have what charging time e.g. rapid charge at 30 minutes, fast charge at two hours and other at eight hours. CAL comment: Please probe conflicts between the Mayor’s climate and air pollution policies. CAL understands for example that planning permission for the new Sky television building in Hounslow may have encouraged biomass burning which the Climate Change Committee assumes will only (eventually) be used off the gas grid and exceptionally. Please ask also if the Mayor encourages in any way the use of standby diesel generators to charge the energy grid. CAL comment: This scheme seems to pass responsibility for tackling air pollution to local authorities. Worse, CAL the Mayor may be attaching onerous conditions to the grant process. CAL gave oral and written evidence to the Transport Committee about the need to reduce shipping emissions. In CAL’s view, the Irish Sea should become a Sulphur Emissions Control Area (SECA) like the English Channel and the Irish Sea and English Channel should both become Nitrogen Emission Control Areas (NECAs). These SECAs and NECAs should be at least as strict as the Emission Control Areas around the United States of America. “I am very concerned that vehicles are being modified in a way that is clearly detrimental to people’s health and undoes the hard work car manufacturers have taken to improve emissions standards. It has become apparent the government had to intervene to clarify the position on particulate filter removal given the unacceptable negative impact on air quality. Please see CAL’s investigation that found tens of thousands or hundreds of thousands of motorists may be driving illegally vehicles that have had factory-fitted DPF’s removed. In CAL’s view, the MOT test does not pick this up easily by relying on visual inspection or onboard diagnostics (OBD). The only reliable solution is a tailpipe test based on lower emission values appropriate for the Euro 5 and Euro 6 and earlier vehicles. Directive 2014/45/EU on periodic roadworthiness tests for motor vehicles and their trailers will not do enough to rectify these problems. Secondary PM2.5 has been identified as a major component of PM2.5 in the UK. This will require control of emissions of the precursor gases: sulphur dioxide, nitrogen oxides, ammonia and VOCs. These arise variously from industrial, domestic, road traffic and agricultural sources. The extent to which UK and other EU emissions of these precursors contribute to PM2.5 in the UK is, however, currently not well understood. This is especially the case for the roles of ammonia and VOCs, as well as the non-proportionalities between changes in emissions and subsequent changes in concentrations. CAL discovered through a Freedom of Information request that claimed reductions in the attributable fraction between 2010 and 2011, published by DoH in the Public Health Outcomes Framework, are due mainly to Defra increasing its calculation of non-anthropogenic PM2.5 from 1.6 mg/m3 in 2010 to 2.6 mg/m3 in 2011. A further request discovered this is not an estimate of anthropogenic PM2.5 but rather the residual (i.e. not explained) element of PM2.5 in the Government’s computer model of this pollutant. The new report is the third to recommend getting rid of diesels. The first two ended up in Defra’s archives with no action taken. For their second study in 2012 they used smog sensing camera traps, in which beams of infrared and ultraviolet light were shone across a busy road to analyse the exhaust plume of passing vehicles, simultaneously photographing their number plates, to measure emissions. The system showed that NO2 emissions for almost every type of diesel vehicle were several times higher than implied by the European Union test results. The latest study uses the same technology to look at buses and other large vehicles and is expected to draw similarly powerful conclusions. The scale of the failure is illustrated by recent pollution levels in Oxford Street, central London, one of the capital’s most popular shopping and tourist areas. The EU limit for nitrogen dioxide is 40 micrograms per cubic metre of air averaged over a year. In Oxford Street it seldom fell below this and sometimes went far above — briefly reaching 800mcg on one occasion last August and often exceeding 400mcg. Last year it was above 200mcg for 1,500 hours; 18 hours is the maximum allowed for that level. CAL understands that emissions of oxides of nitrogen from local energy generation in The Royal Borough of Kensington and Chelsea may be on a trend to exceed those from transport emissions. Well over a year after the Mayor’s Office warned of risks to children in playgrounds when air pollution is HIGH, he has still not launched his Breathe Better Together programme which will reportedly warn people and seek to reduce unnecessary journeys in London on smoggy days. The EAC will be aware the Mayor used pollution suppressants (so called glue) in the build up to the Olympics in front of air pollution monitors and/or at places most likely to warn of smog episodes or exceed legal limits respectively. A report for the Mayor showed particle levels had been reduced by up to 38% near the Upper Thames Street monitor which was at the heart of Olympic Route Network. The Mayor stopped the policy for roads after he was widely condemned. CAL is concerned the Mayor may again be hiding air pollution in front of monitors by using more sophisticated technologies or techniques. Indications include: reported NO2 levels falling at the Marylebone Road monitoring station (used to report the ‘highest’ levels of air pollution in London to the European Commission and the European Environment Agency) relative to levels in Oxford Street (which are not reported to Brussels); and persistent but so far unsubstantiated rumours the Mayor has sought hybrid vehicles (e.g. taxis or buses) that could switch to electric mode near air pollution monitors. Please see also an analysis of the Mayor’s track record by The Green Party. The WHO has published two state of the art reports (REVIHAAP and HRAPIE) and declared each of diesel exhaust, particulate matter and outdoor air pollution carcinogenic to humans. A recent and highly regarded study of studies supported WHO advice in HRAPIE that the long-term health effects of NO2 on mortality as great as those of PM2.5 and independent to them. Given the scale of London’s NO2 problem, it is possible more deaths in London are attributable to NO2 than PM2.5 (though note there may be overlap between the effects). Professional calculations are needed most urgently. By declaring all outdoor air pollution carcinogenic to humans, the WHO highlighted that there is no technology ‘silver bullet’ for tackling air pollution. In public health terms, ‘invisible’ air pollution is where smoking was 30 years ago in terms of the scale and certainty of the risks and the lack of public understanding of them. CAL has developed the Clean Air in Cities app and Birkett Index to highlight locally, regionally and nationally the number of deaths attributable to air pollution. CAL has heard Government officials, public health professionals and others say they do not want to frighten the general public with the truth about the dangers of air pollution e.g. because air pollution ticks most of the 11 ‘fright factors’ typically considered in risk communication. CAL has struggled and failed for years to get Defra or the Mayor to issue proper smog warnings. In CAL’s opinion that silence is totally unacceptable given there is much people can do to protect themselves (i.e. adaptation) and reduce pollution for themselves and others (i.e. mitigation), never mind creating the ‘space’ and momentum for policy action. Recent policy developments include the European Commission’s Clean Air Policy Package published on 18 December 2013 which prioritised full compliance with existing air pollution laws by 2020 and new national emission limits by 2030 (with an intermediate step by 2025). CAL understands the European Commission’s (Commission’s) excellent Clean Air Policy Package published on 18 December 2013 did not include estimates for the number of cost of deaths attributable to NO2 or cost reducing/benefit increasing measures like modal shift to active travel (or the benefits of motorists switching from large diesel to small petrol cars) i.e. its case is understated. The previous Government admitted in its Air Quality Strategy 2007 that costs of measures have typically been overestimated and health and the health and environmental benefits from reducing air pollution underestimated. The EAC will be aware of ClientEarth’s case in the Supreme Court and that the European Commission has singled out the UK for infraction action on NO2.